Nighttime can be a fantastic time to fly: The air is usually still, the airspace quiet, and most would agree that the sight of the stars against the dark sky is a view not to be missed. 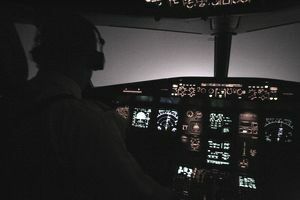 However, night flying has its challenges and, while there's nothing inherently dangerous about flying at night, a night flight can quickly turn hazardous if you're not adequately prepared. Preflight planning—not only the preflight itself—is so important to flying, and night flying is no different. Here are a few preflight planning tips to ensure that you avoid surprises on your next night flight. Make sure you give yourself plenty of time to properly prepare for night flying. During the day, many of us get accustomed to hopping into the airplane after just a check of the windsock and a quick preflight, but things can be a bit more challenging at night. For one, you may not be able to see the windsock as clearly, so you might need to call AWOS or listen to ATIS for navigation cues beforehand. Your preflight will also take a bit longer than usual. You'll have a flashlight in one hand and the checklist in the other, and in general, it's just more difficult to see things in the dark. The aircraft documents, the fuel you've pumped, the surface of the aircraft, your kneeboard, etc.—everything will require a closer look. Be sure to bring two flashlights. You'll need one to hold onto and another easily accessible for when you drop the first one and it rolls to the back of the aircraft. Also, you might consider a head-mounted flashlight, which allows you to be hands-free while still aiming the light at whatever you're looking at. You'll probably want one with a white light and a red light, or a flashlight that does both. The white light is bright enough to see during the preflight and the red light is dim enough to maintain proper night vision during flight. According to the FAA Airplane Flying Handbook, it takes five to ten minutes for the rods in your eyes to adjust to the darkness. Once they do, your eyes are 100 times more sensitive to light than during daylight. After 30 minutes, when your eyes become almost fully adjusted to the darkness, they're about 100,000 more sensitive to light than before. While flying at night, keep in mind that looking directly at something, like another aircraft, can actually cause the object to disappear from your field of vision (it's one of the common nighttime illusions). This is why you should look to the side, instead. It's easy enough to see bad weather during the daytime. At night, however, clouds, rain showers, and thunderstorms are more difficult to see visually. Before you take off, you'll want to be a bit more careful about checking the weather, including current METARs, TAFs, and the area forecast. A flight service specialist can be helpful in this respect, even for local flights. Pay special attention to the temperature/dew point spread. Nighttime is a common time for the fog to form, and it can form quickly. It isn't always necessary or even possible to bring extra fuel, but consider it when possible. It'll be one less thing to worry about when things don't go as planned. You might just be thankful you did when you realize the fixed based operator (FBO) has shut down for the night and there's no self-service fuel available. During your preflight, pay special attention to the navigation lights (position lights) and the landing and taxi lights. Pay attention to the aircraft interior lights, like the panel lights, which can be extremely dim in some older airplanes. If you're a daytime flyer most of the time, you should become familiar with the positions of knobs and levers, the on/off positions of important switches, and the dome lights, if there are any. It wouldn't hurt to review the airport lighting systems. What color are the taxiway lights again? How much runway do you have left when the runway lights turn yellow and then red? Federal Aviation Administration (FAA) regulations say that you need to have accomplished at least three takeoffs and landings to a full stop at night (an hour after sunset to an hour before sunrise) in the past 90 days in order to carry passengers. It's easy to violate this one. Have you ever arrived at an airport just to realize that fuel services aren't available after hours? Or have you tried to fly an approach just to be informed by air traffic control (ATC) that the approach isn't authorized at night? Or planned to take off on a particular runway, only to realize that night takeoffs aren't allowed? It is where it can be important to pay attention to details—including the notes on charts. What's available during the day isn't always available at night. If you're flying a night VFR cross country, your planning will change slightly. Instead of choosing your regular checkpoints, you'll want to choose checkpoints that are well lit and easily seen from the air. A lake bed, for example, which is highly visible during the day will blend in with the rest of the darkness below you, but a city or another airport will be much easier to identify at night. Plan your route along lighted checkpoints like cities, towns, airports, and highways. Make sure you know the terrain around you and your minimum safe altitudes! Emergencies will be different at night. Imagine a complete electrical failure. Instruments are so important tonight flying that a complete electrical failure can come as a complete shock. Once you get your bearings after a scenario like that, you might be stuck doing a no-flap, no-light landing. Another emergency to consider is the off-field or emergency landing at night. During the day, it's simple enough to pick a field to land in—at night, it's a bit more complicated. You don't want to aim for complete darkness, but lights usually mean houses and people.